Shopsmith's new premium abrasive products feature G2 technology, a combination of the highest quality abrasive grains, mated with the most durable backings to give you the fastest-cutting, longest-lasting abrasives available. Start enjoying superior finishing results with these revolutionary film-backed sanding discs that resist tearing and edge wear to give you four times the life and a super-smooth sanding surface. 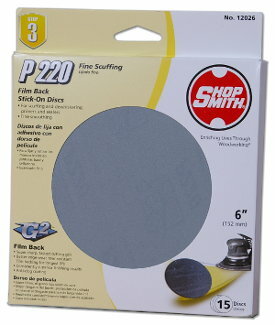 Film back stick-on discs are available in 40 grit, 80 grit, 100 grit, 120 grit, 150 grit, 180 grit, 220 grit and 320 grit. Note: We advise you to always wear an N95 (NIOSH-Certified) Respirator when sanding to filter out 95% of airborne particles.